“The Politics of Revolutionary Surprise,” Project Syndicate, February 2, 2011. Russian translation (by Alina Raskov): “Islamskaia ekonomicheskaia mysl’ i Islamskaia ekonomika,” in Hristianstvo i Islam ob Ekonomike, ed. Danila Raskov (St. Petersburg: NPK Rost, 2008), 279-304. Reprint: Islamic Finance, ed. M. Kabir Hassan and Mervyn K. Lewis (Cheltenham, U.K.: Edward J. Elgar, 2007): 141-159. Reprint: Islam and Globalization, vol. 4, ed. Shahram Akbarzadeh (New York: Routledge, 2006), 11-31. Reprint: Economics and Religion, vol. 2, ed. Paul Oslington (Cheltenham, U.K.: Edward J. Elgar, 2003): 277-95. Turkish translation (by Yasemin Tezgiden): “İslâm Ekonomisi ve İslâmî Alt-Ekonomi,” in Timur Kuran, İslâm’ın Ekonomik Yüzleri (İstanbul: İletişim, 2002): 73-100. Reprint: The Political Economy of the Middle East, vol. 3, ed. Timothy Niblock and Rodney Wilson (Cheltenham, U.K.: Edward J. Elgar, 1999), 57-75. 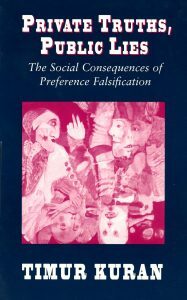 Private Truths, Public Lies: The Social Consequences of Preference Falsification (Cambridge, Mass. : Harvard University Press, 1995), xv + 423 pp. Russian translation (by Irina Soboleva), with an additional preface: in press, 2016. Chinese translation (by Ding Zhen Huan and Ou Yang Wu): Pian Hao Wei Zhuang De She Hui Huo Guo (Changchun: Changchun Publishing House, 2005), 287 pp. Turkish translation (by Alp Tümertekin), with an additional preface: Yalanla Yaşamak: Tercih Çarpıtmasının Toplumsal Sonuçları(Istanbul : YKY, 2001), 498 pp. Swedish translation (by Margareta Eklöf): Privat Sanning, Offentlig Lögn (Stockholm: City University Press, 1999), 424pp. German translation (by Ekkehard Schöller), with an additional preface: Leben in Lüge: Präferenzverfälschungen und Ihre Gesellschaftlichen Folgen (Tübingen, Germany: J.C.B. Mohr, 1997), xviii + 462 pp.